If you want to learn how to create a Lead Generation Form then you can read this help article. N.B. You need access to your website's files to be able to embed a form. If you don't have access or you don't feel confident editing the files of your website then it's probably best to email this help topic to the person who takes care of your website. 1. Head on over to the Forms page and in the Forms List find the form you want to embed. 2. Click on the Embed Form Code button. 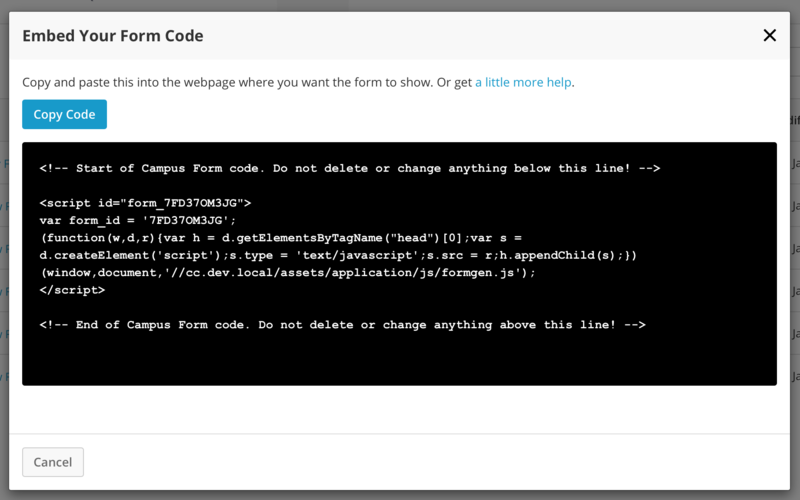 This will open an Embed Your Form Code window. Click on the Copy Code button to store your form code in your computer's clipboard memory. 3. Now go to the file in your website files where you want to place your form and paste in the embed code. 4. Save your website's file and you're done (remember if you've been working on your website files locally then you'll need to 'put' them to your live site).